Pawer. / Behind the Pet Stores. Pet stores are very popular in Japan. There, you see cute puppies and kittens being displayed. If you visit pet stores everyday for a month, you may see some grown ones in the corner being on sale; however, you will notice that most of them in the main displays are very young like 8 weeks old. Every single dog and cat cannot be sold before they grow too big or become an adult, which makes us question how is it possible for a store to keep only the young ones in the displays? Where do the unsold ones go? The pet industry is worth about 1.4 trillion yen and animal sales itself is worth 96 billion yen in Japan. That includes breeders, puppy mills, pet auctions, pet shops, and those who help to dump unsold puppies and kittens. These puppies are sold online. 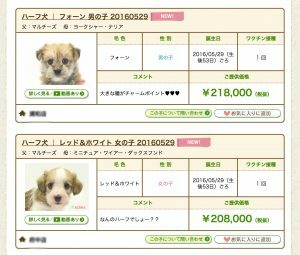 Nowadays a lot of pets are available to buy online in Japan. 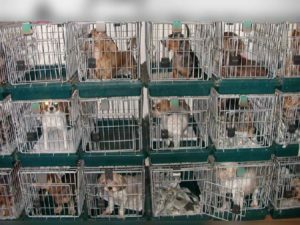 There are over 100,000 dogs and cats culled every year; however, it is expected that there will still be many people interested in buying new pets when they could still adopt. That is why the breeders and puppy mills continue to produce. These puppies and kittens are taken away from their mothers, packed in boxes, shipped to auction centers, then to pet stores. It is a long stressful process especially for animals that are only a few weeks old. According to the book, Who kills dogs, by Masahiko Ota, over 15,000 dogs were reported as “missing” during the shipment process. They were assumed to have died from the stress. 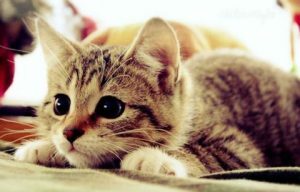 Japanese people tend to prefer small animals such as small breeds or puppies and kittens. Therefore, in the mass-production factories of puppy mills, dogs including those that are too young to breed are forced to produce litter after litter of puppies. The newborns are separated from their mothers and brothers after about a month, and put up for auctions, and end up in pet store displays. 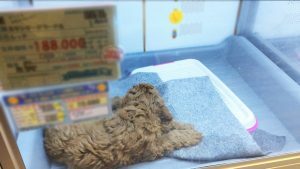 In Japan, it is very easy to buy a pet at pet shops. You just pay for it. 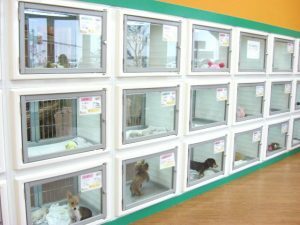 There are some laws and regulations about animals sold at stores; however, the supervision by the government is not strict at all. Inbreeding has been done at puppy mills to save expenses, and as a result, weak ones are produced with genetic issues. 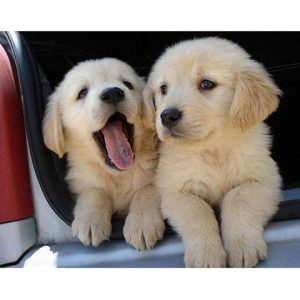 Separating the newborns from their mothers and brothers so soon in their life is considered as one of the reasons for the increase in a dog’s lack of social skills, barking issues, and biting habits. Many people may be buying pets at stores because they look cute in their displays without thinking or knowing how they were actually produced and ended up there. There are pet stores where they have seasonal sales on pets and some people buy them on impulse as Christmas presents. Those stores where profit is the priority and treat dogs and cats as products usually are not strict on reviewing a new owners’ lifestyle or ensuring that they’re matching their personalities. As a result, a lot of dogs and cats with health or behavior issue without proper training could be out of control, and those are one of the main reasons for why owners surrender their pets. 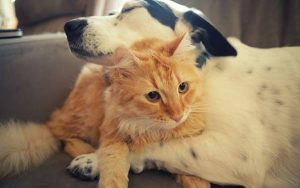 Every single dog and cat is unique, but there are also typical habits and personalities that depend on their breed. For example, digging and barking are two main characteristics of dachshunds. If you look at the history of dachshund, you will find that it is a scent hound dog breed that was bred to hunt badgers and other tunneling animals, rabbits, and foxes. They were taught to bark loud to let the owners know that they found the game. Dogs and cats are typical pets in Japan. At pet stores where their priority is not profit but for the pet itself, the staff usually talks to the customers about their preference, characteristics of its breed, home environment, and so on to ensure better matching. By giving information about the pet before new owners actually buy them, the new owners can avoid the trouble they may experience after the purchase, such as unexpected growth or behavioral issues of the pets. This should be a normal process that staffs at pet stores follow if they love and take proper care of their puppies and kittens. Any staff who treated them with respect would wish for the pets to be treated well. It is ideal that there is a bond and trust between a customer and staff at pet stores even after a pet is sold. The Ministry of the Environment recommends checking the listed below when interested in purchasing a pet at any animal handling business such as pet stores. These are the things that they are required to do in order to run the business. Some pet shops and dishonest breeders are hard to tell from the outside. If you are unsure of a particular pet store, just go in and talk to the staff. They may tell you how cute they look or ask you questions and listen to you in order to try to find which pet may match you. You know that you will want to stay with the latter. If you buy a puppy from a dishonest pet shop or breeder, it would be the same as supporting them to continue what they do. Please take a moment and think about how puppies and kittens ended up in the pet shop displays at a very young age, when they should be with their mothers and brothers. Please, think about it once.